CARICOM Secretariat, Turkeyen, Greater Georgetown, Guyana - The Caribbean Community (CARICOM) and the Kingdom of Spain on Thursday, 24 April continued to build on the long-standing relationship formalised in 1999, with the accreditation of a new Plenipotentiary Representative of Spain to CARICOM, H.E. José María Fernández López de Turiso. In receiving the Letters of Credence from the Spanish Ambassador at the CARICOM Secretariat, CARICOM Secretary-General, Ambassador Irwin LaRocque said the relationship has been characterised by formal and institutional arrangements which have seen four Summits and two meetings of the CARICOM-Spain Joint Commission. He noted that despite the severe economic challenges that have confronted Spain in recent years, that country continues to be not only a critical international development partner, but also a reliable and supportive one. Secretary-General LaRocque highlighted the critical support provided by Spain in the areas of water and sanitation, health and non-communicable diseases, agricultural development, fisheries, tourism, services, electoral observation and other key economic and social areas. He also highlighted Spain’s support for the diplomatic and Spanish language training of officials across the Region, which has allowed for more effective CARICOM representation in international fora. Referring to the CARICOM-Spain Joint Fund which was established in November 2011, the Secretary-General noted that Spanish technical cooperation with CARICOM has been further enhanced as a result. “In 2012, projects were funded in the areas of agriculture, food security, institutional support and trade and economic integration. These areas are crucial for the sustainable economic development of the Community”, he stated. So too are the projects in the areas of security, youth and gender, which Spain contributed to in 2013. “It would be remiss of me not to make specific mention of the significant contributions that Spain has made and continues to make in the development of Haiti, in the aftermath of the devastating earthquake in January 2010”. The Secretary-General called the newly accredited Ambassador’s attention to the effects of the global financial and economic crisis, which he said Spain was “all too familiar”; and to its impact on the small, open, highly-indebted and vulnerable countries of the Caribbean. This impact, he noted, has been far more severe and is compounded by other actions which have their geneses outside our borders. He cited climate change and the practice of many international development partners of ‘graduating’ or `differentiating’ countries that are categorised as Middle Income, which prevents them from accessing concessionary financing, as two examples. 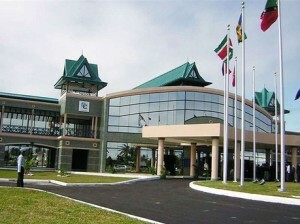 The Secretary-General said CARICOM was looking forward to continued engagement with Spain in the Third Meeting of the CARICOM-Spain Joint Commission scheduled for 19 May 2014, in Georgetown, Guyana and at the Seventeenth Meeting of the Council for Foreign and Community Relations (COFCOR), the following day. In his response, Ambassador Fernández López de Turiso noted that the signing of the CARICOM - Spain Joint Commission, expected to take place in Guyana in May 19, would signify the provision of additional funding by Spain for cooperation programmes. “The Caribbean region holds a special place in the affections of my country,” he said, adding “over the past 15 years Spain has adopted a Caribbean policy, driven by economic and political interests, and directed not only at the Spanish-speaking countries but to all the nations of the region”. CARICOM-Spain cooperation, he continued, has been premised on political and financial instruments such as the Spain-CARICOM Summits and the Spain-CARICOM Joint Fund which has mobilized US $20.5 million for regional projects, as well as mechanisms for political dialogue in the European Union and the United Nations. “Over these past 15 years, Spain has been among the top 10 donors to CARICOM. If we also consider bilateral contributions to member countries, it would show that Spain is one of the main development partners in the region,” Ambassador Fernández López de Turiso said.